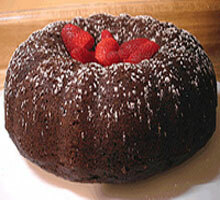 This Low Fat Chocolate Cake Recipe offers you great taste at half the calories. Take it from me, a recent graduate of the Weight Watchers Program...this cake recipe is both a keeper and a lifesaver! If you've got to have your daily chocolate "fix" but don't want to "tip" the scales then make this recipe and cut yourself a (small) piece everyday and enjoy! Give it a try...I guarantee you won't be disappointed. I'd like to thank Leigh for sharing her picture of a low fat chocolate cake. Her recipe was taken from the Veganomicon cookbook which you can order from Amazon. To view Leigh's photostream at Flickr.com. click here! Add the applesauce and mix well until the batter is smooth. Bake for 50-55 minutes until done. Frost if you'd like and enjoy!